IT Managed Services & Consulting |Chapel Hill|Durham|Raleigh Just Announced! Progressive Awarded Top 100 MSP ! | Progressive Computer Systems, Inc.
Just Announced! Progressive Awarded Top 100 MSP ! April 27, 2017: Progressive Computer Systems, Inc. has been named to After Nines Inc.’s ChannelE2E Top 100 Vertical Market MSPs list and research (http://www.channelE2E.com/top100). The list and research (hashtag: #Top100MSP) identify and honor the top 100 managed services providers (MSPs) in healthcare, government, financial services, manufacturing and additional vertical markets. 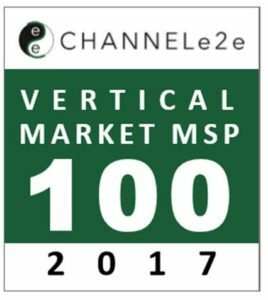 The Top 100 Vertical Market MSPs rankings are based on ChannelE2E’s Q1 2017 readership survey. MSPs featured throughout the list and research leverage deep vertical market expertise to drive annual recurring revenues (ARR) in specific market segments. The most successful vertical market MSPs are zeroing in on financial services and healthcare, although consolidation in the healthcare IT services sector is accelerating. MSP micro-verticals have emerged. Examples include IT services for veterinary hospitals (healthcare); hedge funds (financial services), and clubs and resorts (hospitality). The MSP shift from device management to user experience is still accelerating. Top 100 MSPs now manage 513 million people and their user experiences vs only 401,445 devices. 53 new companies made this year’s list. The list churn involves ChannelE2E’s rapidly expanding readership combined with MSP M&A activity. Progressive Computer Systems, Inc. was ranked among the top vertical market MSPs in Healthcare. Over the past 30 years, Progressive Computer Systems, Inc. has been a leading IT provider offering proactive IT services focusing on IT infrastructure, Managed Services, Network Security, Business Continuity, Strategic Planning, and Compliance Services. Their mission is to provide the highest level of customer satisfaction, to always operate with integrity, to maintain a level of technical expertise, to become the trusted advisor, and to cultivate long-standing relationships with both their clients and staff. For more information, visit http://www.pc-net.com or call 919-929-3080. ChannelE2E, powered by After Nines Inc., tracks every stage of the IT service provider journey — from entrepreneur to exit. Through exclusive blogs, research and crowdsourced databases, our content guides VARs, MSPs, CSPs, ISVs and the broader IT channel through the five stages of business: Startup, growth, sustained performance, pivot and exit. ChannelE2E also tracks the top IT automation tools and technologies that drive partner profitability. For content, research and crowdsourced database information, please contact Content Czar Joe Panettieri (Joe@AfterNines.com). For sponsorship information please contact President and CEO Amy Katz (Amy@AfterNines.com). Visit ChannelE2E daily (www.ChannelE2E.com) and follow us on Twitter (www.twitter.com/ChannelE2E) and Facebook (www.facebook.com/ChannelE2E).